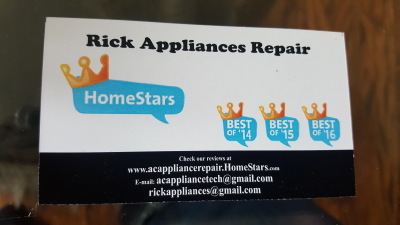 We at Rick Appliance Repair specialize in repairs and services to all make and models for major leading brand names of domestic home appliances.We have built our reputation on word of mouth and pride ourselves on the long term relationships we've built with each and everyone of our customer's. We are not just a company that carries out repairs, we are passionate and we value and understand the needs of our customer’s requirements. We never give up on repairing any appliance unless we know we have tried everything possible and we make sure at the end we guarantee to have a pleased customer.We are fast and efficient, ensuring the best service and customer satisfaction. 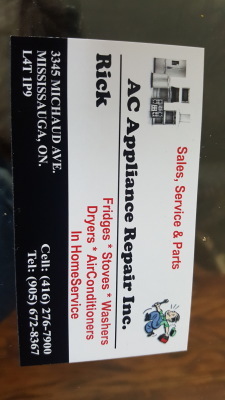 Servicing Toronto and surrounding area since 1989.